YEREVAN, Armenia — An assassination attempt on a presidential candidate has thrown this month’s election into doubt and could threaten stability in the volatile Caucasus region, which carries oil and natural gas to Europe. Paruyr Hayrikyan, an outsider in the Feb. 18 presidential vote, was shot in the shoulder on Thursday night close to his home in the capital, Yerevan. Doctors removed the bullet Friday and said his life was not in danger. 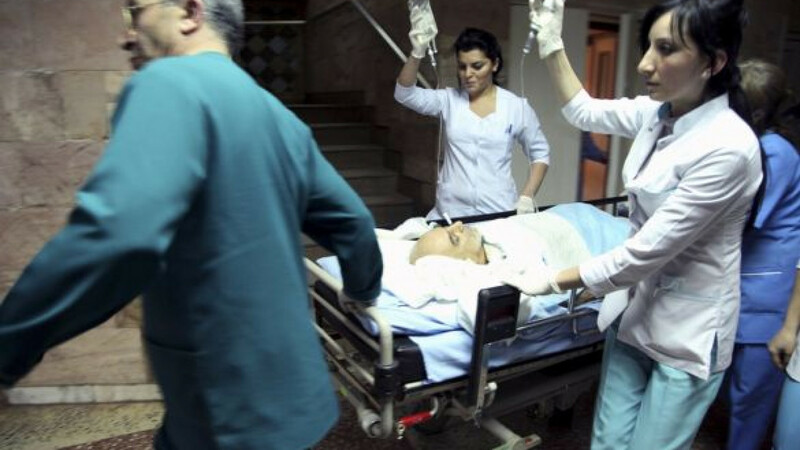 Hayrikyan, one of eight candidates in the presidential race, said from the hospital after surgery Friday that he would initiate proceedings as allowed by the constitution to delay the vote for 15 days due to his condition, but not longer. The motive was not immediately clear. In the election, incumbent President Serzh Sargsyan is widely expected to secure a second five-year term. Stability is vital for the former Soviet republic of 3.2 million to woo investors and boost an economy devastated by a war with neighboring Azerbaijan in the 1990s and then by the 2008-09 global financial crisis. The attack will raise fears of a return to the violence that left about 10 people dead during the 2008 presidential election in the landlocked country, Russia’s main ally in the turbulent South Caucasus. A few hours after undergoing surgery, Hayrikyan said he suspected that a foreign secret service, perhaps Russian, was behind the attack. He recently made statements about Armenia’s need to take a pro-Western course. Any sign of instability in the Caucasus is a concern to investors because although Armenia has no pipelines of its own, pipelines carry oil and gas to Europe via Turkey through Azerbaijan, which still has fractious relations with Armenia. Russia has a military base in Armenia, which is a member of a Moscow-dominated security alliance of former Soviet states. Investors are already worried that violence could break out again over Nagorno-Karabakh, a mountainous enclave inside Azerbaijan that is controlled by ethnic Armenians. A war in the enclave in the early 1990s killed 30,000 people. Relations with another neighbor, Turkey, are also fraught because Ankara does not recognize as genocide the killing of Armenians in Ottoman Turkey in World War I. Turkey closed its border with Armenia in solidarity with Turks in Azerbaijan over the Nagorno-Karabakh war. The Organization for Security and Cooperation in Europe expressed concern over Thursday’s attack. “This attack is deeply distressing in view of the electoral process already under way, and I urge all stakeholders to refrain from any actions that might further aggravate the situation,” said Ambassador Janez Lenarcic, director of the OSCE Office for Democratic Institutions and Human Rights. Hayrikyan, 63, is a Soviet-era dissident who survived Soviet prison and internal exile as well as forced deportation from the U.S.S.R. to Ethiopia and the U.S. He leads a moderate opposition party, the National Self-Determination Union, and ran for president in 2003. Armenia was isolated and in chaos after the collapse of the Soviet Union in 1991, and things got so bad in the 1990s that people cut down all the trees in Yerevan to use as firewood. Matters have improved since then, but the 2008-09 global economic crisis set back the recovery, and the average nominal monthly salary is still under $300.